﻿ AinB Gothic - Cathedral, Barcelona | FROM $115 - SAVE ON AGODA! Have a question for AinB Gothic - Cathedral? 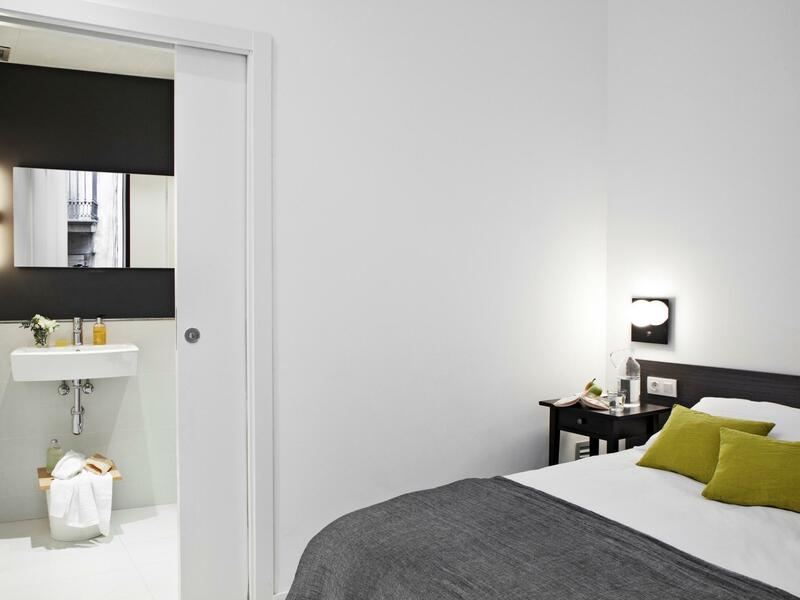 Situated among many tourist attractions such as Las Ramblas, the Cathedral and the city of Barcelona, this is a place with a great location for your stay in Barcelona. AinB Gothic - Cathedral is a refurbished, gothic style building located just a few meters away from the metro stop, Jaume. Other than the uniquely, fashionable exterior, the room comprises of modern amenities. The hotel is also surrounded by attraction spots such as bars/pubs, bicycle rental service, coffee shops, night clubs, restaurants, salons, and a casino in the town. All of these together with the friendliness of the staff have made AinB Gothic - Cathedral a must-stay place. Whether you’re traveling with friends or family, AinB Gothic - Cathedral is the best option that supports your quest in the city of Barcelona. Kettle didn't work, nothing to clean with (and there is no maid), no basic toiletries, were given the wrong code to get in the front door, location is different from what you are told at the website (that is the reseption), balcony is minescule and you get told off for being noisy if you sit there and talk! When we arrived we were at reception, not an apartment and we had to trundle our luggage across town to the apartment, not the best after a long day. The room on the website looked much better than the one we stayed in and while it was spacious and clean there were no toiletries not even a bar of soap. The wardrobe/cupboard doors generally jammed and scraped on the floor, it was not what we expected and we wouldn't go back. Staff were welcoming, a short walk to the apartment. Clean, everything you need and a comfy bed! As a couple we spent three nights here, it was modern with good facilities had a comfortable bed and was reasonably quiet. Tip for women travelling alone: I would not want to stay and walk these streets as they are dark and sometimes lonely at night although in a great location near to the port. I would stay somewhere that was busier like The Condor off La Rambla. It was a pleasant stay. Great service from all the staff, you can find convenience store and restaurant near the area. If we come to barcelona again, we'll definitely stay here. We are a family of six person. In the apartment there were four beds and one sofa for two in the combined living room-kitchen. Bedrooms were very small. The apartment was modern but impractical, for ex. in the bathroom there were no hangers for towels. Dining table and chairs were only for four. During our five day staying we asked several times new batteries for remote control without any response. The beds were made and wastebasket taken out once, but they did not clean the floor. The location was excellent in the medieval old city. We love the location of this hotel even a bit off from the main street. It is in the quiet area which only 5 minute walk to old city which we been walking around to La Ramblas which a lot of shops. Location was great - close to main sights,restaurants and shopping areas. However apartment was lacking comfort and basic facilities. The kitchen needed more pans,utensils in order to make a basic meal. There were no tea towels . We found it difficult to get the hob working and no instructions/book was provided for any electrical items throughout the apartment. The sofa was uncomfortable, there were no soft furnishings e.g cushion or ornaments. Lounge lacked a coffee table. Bedroom didn't have a full length mirror and no bathroom cabinet. The most worrying aspect was no fire blanket or extinguisher and no fire exit plAn or instructions. Gr8 Location, good layout, friendly and helpfull staff! Had a awesome time in bcn, and really enjoyed staying at Ainb gothic catgedral! Very neat and modern also gr8 latout to relax and spacious enough! I would however recommend to get a shower door to prevent the bathroom floor getting wet every time someone takes a shower, also had problems with the aircon, and the main bed is 2 single beds pushed together that werent exactly the same hight! But would stay there again and had the best time in barcelona! At first glance the apartment appeared small with one of the bed alternatives being a sleepingcoach. However, ceiling height newly renovated rooms and beds not at all uncomfortable paired with the rustic and superb location made it worth while. Everything was great except for the shower. It wasn't that grave of an issue just a little annoying that the water would go out but nothing that made the trip horrible or anything. Other than that everything was good and wouldn't mind staying there again. first of all i have to thank to receptionist Tarık, he sent us our canon dslr photo machine by taxi to the airport which we forgot in the room and also he was very helpfull during our stay. the rooms has enough big four us (we stayed there three tall person). 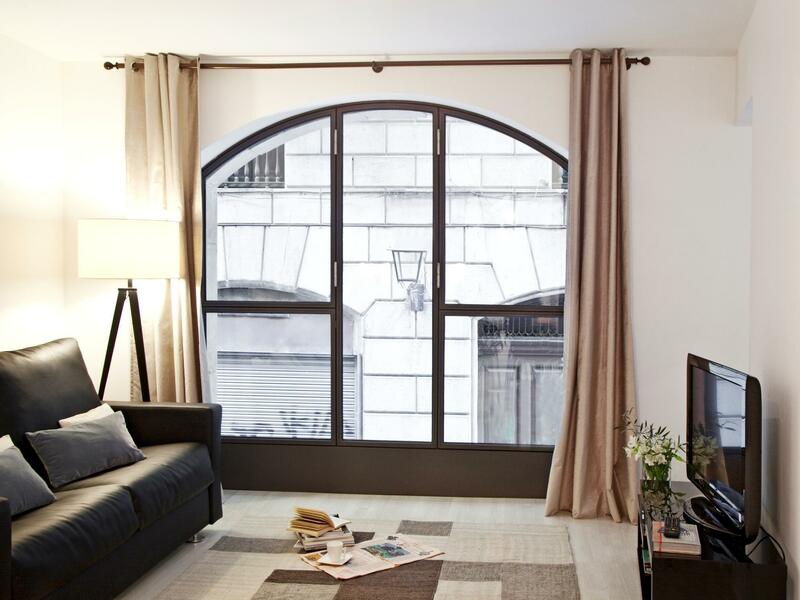 100 hundred meters to dia (a cheap- medium supermarket) 6-7 minute walks to la rambla(also middle of the street) and plaça reial also 3-4 minute walking to the beach. middle of the gothic quarter. after reach the la rambla it takes to plaça catalunya about max. ten minutes walking. soundproff and the wifi is efficient. all building using as an apart hotel. only critisism is the beds under need to clean. there is no dishwasher but there is a washing machine . It has a very nice location, which is near two different metro. Close to the sea port, many restaurant nearby. Quiet at night. Friendly staff. Clean and cosy. Absolutely brilliant time in Barcelona. AinB has managed to get the perfect balance between an apartment and a hotel. They are all very attentive and you have your room cleaned daily which makes it feel a lot more like a hotel. The apartment is exactly like the pictures if not a bit bigger. The kitchen is very easy to use and they supply ample utensils so it is very easy to cook every if you so wish. An added bonus was that upon arrival they marked up a map of barcelona and all the places they recommend to eat which was brilliant. Will be coming back to stay here in summer for definite. The main check in is on the Main Street at Jaume I. The apartment building is located about 5mins walk. There's a mini market nearby, restaurants around the corner. Sensi and oriel are gd for tapas. Las rambles is just about 5-10 mms walk. Our apartment was comfortable, bed and sofa bed comfy. Hot shower worked and ample bathroom space. Place was centrally located. You can go to anywhere from here. However, the reception and the place of apartment is 5mins away, no biggy as you only need to walk over on the day you check in. We stayed 4 people to a room and it was quite comfortable considering. 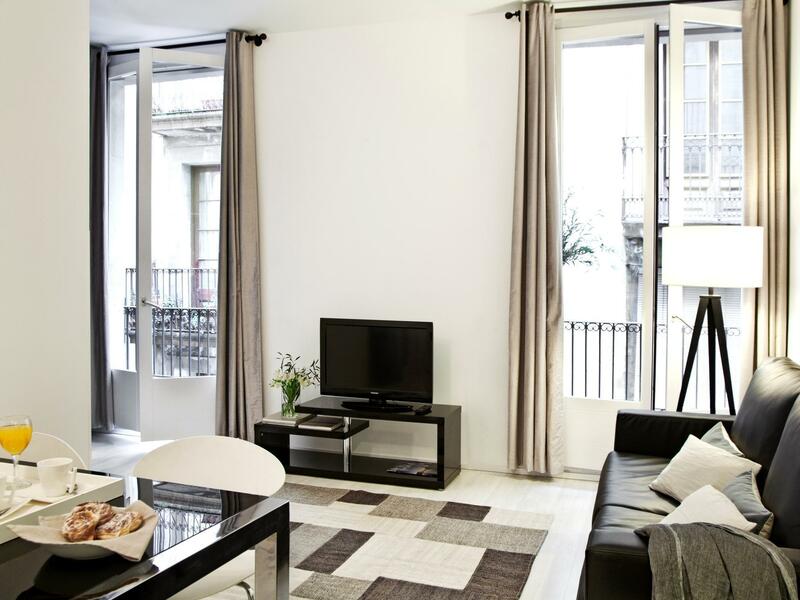 I would definitely recommend this apartment if you're staying in Barcelona for sight seeing, nightlife or shopping. It was quite noisy with construction going on, other than that we were all very happy. The staff was helpful (and they also held our luggage until the evening after we checked out. If I return to Barcelona, ill most probably stay at the AinB again.